During this week’s The International Surfaces Event 2018 (TISE), Daltile, Marazzi and American Olean will be prominently integrating digital technology into their shared booth space via 28 strategically placed iPads, a virtual reality home, selfie stations, a 600 square foot animated LED floor/wall main stage full of live presentations and an additional 1,200 square feet of video playing throughout the space. 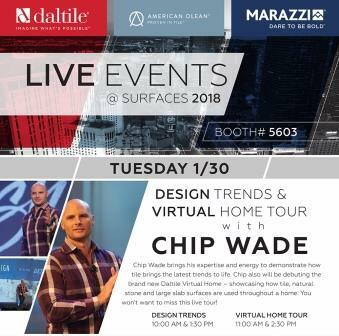 Expert craftsman, celebrity designer and host of HGTV’s Elbow Room, Chip Wade, will be on hand in the Daltile booth (Booth #5603) on day one of Surfaces 2018 talking about design trends and debuting the Daltile Virtual Home that he has helped bring to life in coordination with the brand. In his trademark fun and personable style, Wade will conduct full digital “tours” of the 360-degree virtual home. Wade’s walk-throughs will be projected onto a 600 square foot animated LED floor/wall screen on the Daltile main stage and also broadcast to the greater Surfaces exhibit floor audience via overhead screens encircling the outside of the booth. The goal of the Daltile Virtual Home is to show how tile can be used throughout an entire home, inside and out, as well as the many unique ways in which tile can be showcased in a home. Design Trends 10:00 a.m. and 1:30 p.m. Virtual Home Tour 11:00 a.m. and 2:30 p.m.